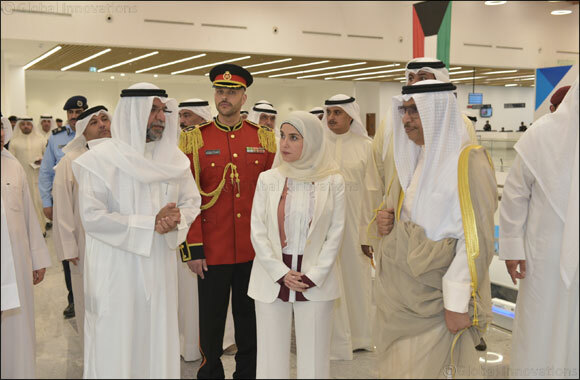 Kuwait, May 15, 2018: His Excellency the Prime Minister of Kuwait, Sheikh Jaber Mubarak Al Hamad Al Sabah today inaugurated Jazeera Airways’ terminal at Kuwait International Airport. The terminal is the first terminal to be owned, built, and operated by a private airline in the Middle East, thus marking a significant milestone in the development and privatization of the Middle East aviation system. Upon his arrival, the Prime Minister (PM) and dignitaries received a briefing on the terminal’s facilities by Jazeera Airways Chairman and founder Marwan Boodai, who also designated the PM as the terminal’s first passenger in honor of his visit. Boodai then led the PM on a tour of the state-of-the-art facility, which was built in 11 months. The PM was joined by Her Excellency the Minister of State for Housing Affairs and the Minister of State of Services Affairs Ms. Jenan Ramadan, and the President of the Directorate General for Civil Aviation Sheikh Salman Sabah Al Salem Al Hamoud Al Sabah. Jazeera Airways Chairman Marwan Boodai said, “We are honored by His Highnesses’ visit, and the ongoing support by His Highness and the government as a whole for empowering the private sector towards achieving Kuwait’s vision for the year 2035”. Boodai added, “Today is a historic turning point in the development of the Middle East aviation system and a testament to the value that the private sector brings to the development of the country. With an award-winning design and state-of-the-art facilities, the terminal will start commercial operations next Tuesday the 22nd of May, and as a result congestion currently experienced at the main terminal at Kuwait International Airport will show immediate signs of relief. We are confident that our travelers will love flying through the Jazeera terminal”. “The year 2018 is indeed a transformational year for Jazeera Airways. In addition to the start of terminal operations next week, we are also excited to announce that Jazeera Airways will welcome the first Airbus A320 NEO in the Middle East to our young fleet”, said Boodai.